Be the first to share your favorite memory, photo or story of Brad. This memorial page is dedicated for family, friends and future generations to celebrate the life of their loved one. 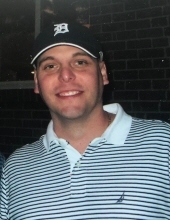 Brad Amick, age 40 of Canton, passed away on March 30, 2019 after a long illness. Beloved son of Janet (Robert) Proverb and the late James R. Amick. Loving brother of Brian (Brandee) Amick. Proud Godfather of nephew Kyle Amick and had a very loving relationship with his nieces Brianna Amick and Kendall Amick. Brad graduated from Stevenson High School in 1996 and then earned his associates degree from Schoolcraft College. Throughout Brad’s life sports played a huge role in his development, from watching sports like football or hockey on TV to playing sports at a high level. Born with a gift to play hockey, Brad would develop into an all-star hockey player and eventually play at the highest amateur level of AAA. Dedicated lifelong Detroit Lions Fan , Detroit Tigers along with the Detroit Red Wings. Brad never missed an opportunity to watch the favorite hockey team the Detroit Red Wings whether on TV or live and nobody was a bigger Red Wing fan than Brad. On Friday, March 29th Brad was planning to attend Red Wing game even under hospice care but was unable to make the trip to Little Caesars Arena . Brad was with the Red Wings that night in spirit as they beat the New Jersey Devils by the score of 4 to 0. A visitation will be held at the Schrader-Howell Funeral Home 280 South Main St, Plymouth on Thursday, April 4th from 4:00pm-9:00pm. Funeral service Friday, April 5th at 11:00am at the funeral home. In lieu of flowers , the family requests donations may be made to St. Jude Children's Hospital 501 St Jude Place Memphis, TN 38105 in memory of Bradley Amick. "Email Address" would like to share the life celebration of Brad Amick. Click on the "link" to go to share a favorite memory or leave a condolence message for the family.